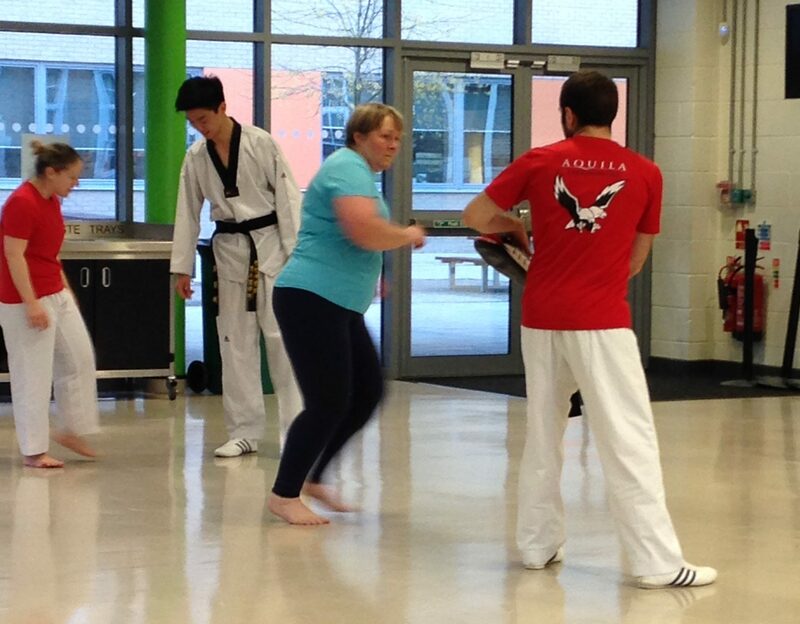 Speed and agility are the hallmarks of taekwondo. To be honest, neither of them are my hallmarks. Which didn’t bode well for me and taekwondo and its emphasis on head-height kicks, jumping and spinning kicks, and fast kicking techniques. Who wouldn’t want to practice a sport, and live their life, according to these values? 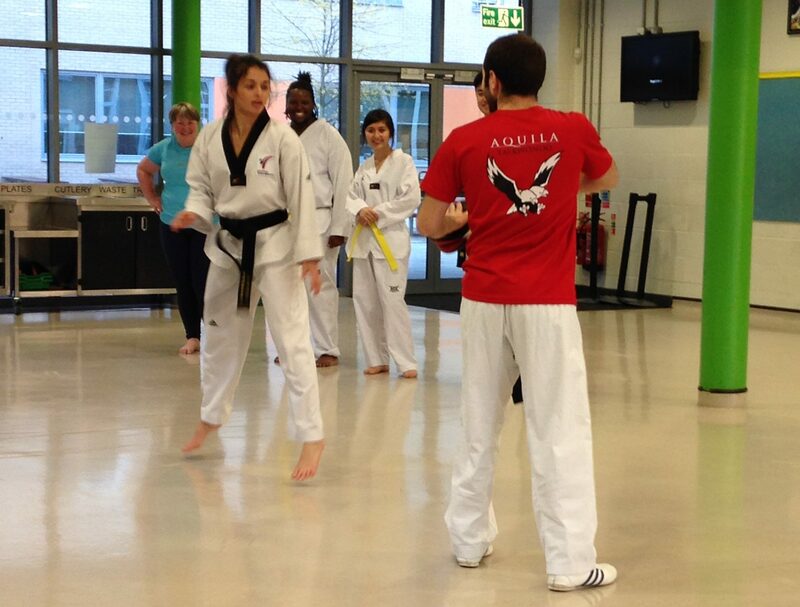 Aquila Taekwondo has been offering classes in traditional and Olympic style taekwondo for children and adults at a range of venues in SE London since 2013. The club now has more than 100 members, the youngest is four and the oldest is 80. Beginners, like me, are welcomed and can join a class for free. Watching the class I understood why: Master Terry led the class, calling the drills, encouraging and correcting those who were less familiar with the routine and repetition. If anyone messed about or giggled, they got a glare from their classmates and a special mention from Master Terry. 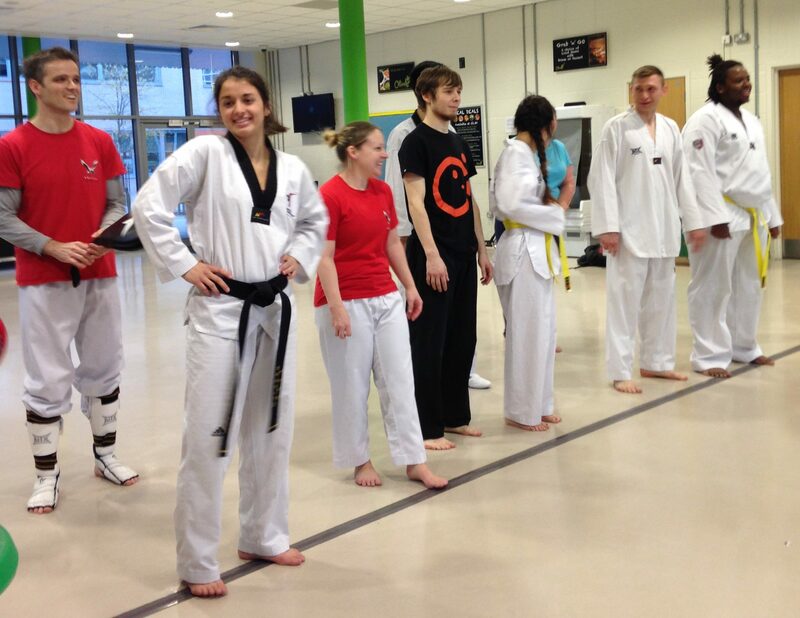 I realised how much of taekwondo was about respect – for yourself and others. I started to worry about my inability to follow routines in step classes, and how I’d fare, balancing on one leg to deliver a kick. 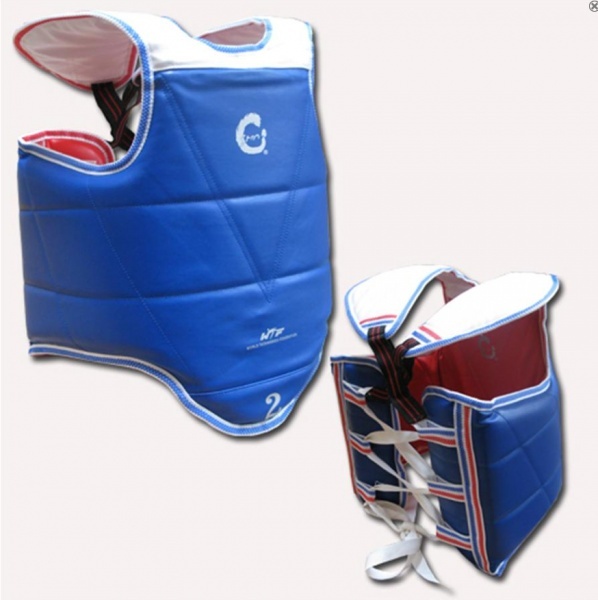 Some of the juniors left, and those who stayed behind began pulling on trunk protectors to practice sparring. I joined the adults’ class in a separate part of the dining hall, and Master Kuzey led us through a series of stretches: in Korean for the rest of the class, and with an English explanation for me. Everyone else was wearing dobok (the taekwondo uniform of loose-fitting trousers and jacket), I’d gone for my usual outfit of leggings and a T-shirt: ‘just wear something that’s comfortable and you can move in’ the email had said. After stretching, we divided into two groups and lined up to face each other. Master Kuzey explained kyung-ye (how to bow), how to hold my arms, and ahp-pro (how to move forward). In our lines, we bowed and began moving towards our partners with the aim of tapping their shoulder with an outstretched arm. It sounds straightforward, until you factor in the stance, bounce, and forward movement you need to make to get close enough to tap your partner’s shoulder – while they’re trying to do the exact same thing to you. I may have landed a few taps. My partner Steve may have stood still a few times. When Master Kuzey called a halt, we bowed and moved along the row to repeat the same drill with a different partner. I noticed how the height of my partner made no difference to my ability to get close enough to land a tap on their shoulder, while none of them had any difficulty landing a tap on me. Next up, we practiced kicking drills. We pulled on trunk protectors and laced each other up. The trunk protector was surprisingly light and didn’t seem to restrict any movement – which surprised me. 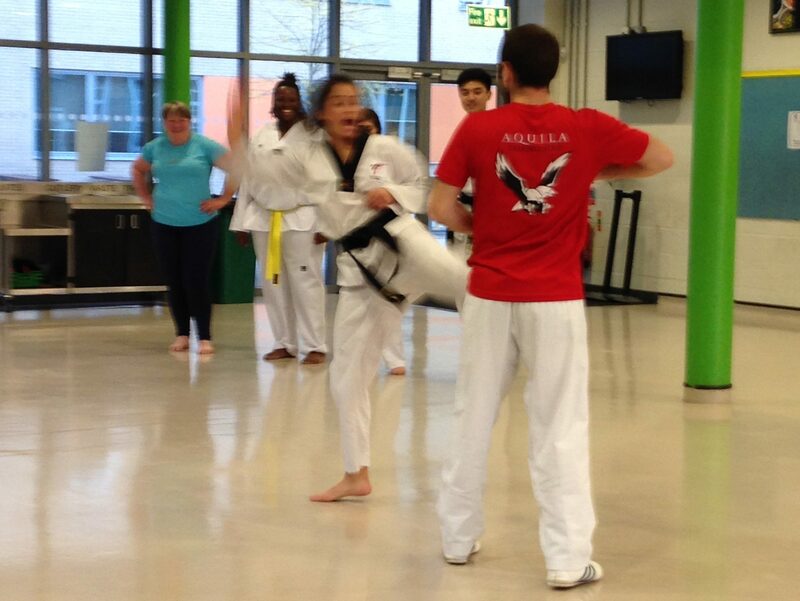 Master Kuzey explained how to raise my leg then kick from the hip to land a kick on my partner’s trunk. I suspected I’d be lucky to raise my leg let alone connect with my partner’s trunk. We practiced. My partner Stephanie was very patient and gave me plenty of coaching, getting me to repeat the drill instead of taking her turn. Master Kuzey watched and pointed out I was flicking my leg from the knee rather than kicking from the hip. 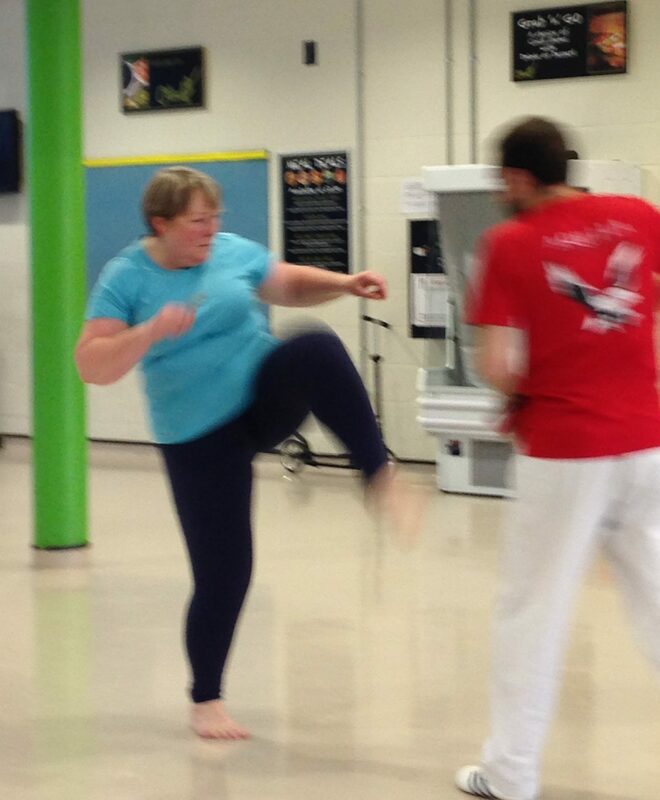 I tried again and managed a better kick. All around me I could hear people calling ki-hap (yell of power) as they landed a kick. It was infectious and I started calling out too. We moved on to practice a sequence of moves, a step-hop on one foot followed by a kick to the trunk. Master Kuzey told me to take it slowly and focus on getting the move correct rather than trying to complete the sequence at speed. I was relieved – it was taking all my concentration to make the moves. Under Stephanie’s careful eye, my technique improved and I began to feel more confident about completing the sequence. But when it was Stephanie’s turn I could see the skill, pace, and power she packed into each move. Some of the class were due to compete at the weekend so Master Kuzey was careful to ensure the drills provided a good workout without risking any injury. 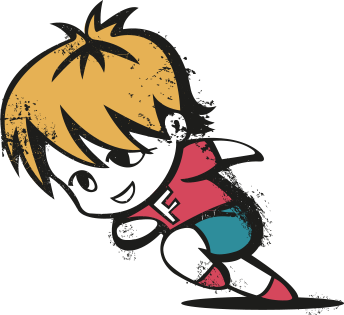 He talked about the importance of conserving and using the body’s energy through the relax/strike principle: between blocks, kicks, and strikes you should relax the body, then tense the muscles only while performing a move. I understood completely what he said but suspect I’d need more than a few classes to perfect it. And told him I’d be back the following week. When I arrived for my second class, much of the talk was about the competition. 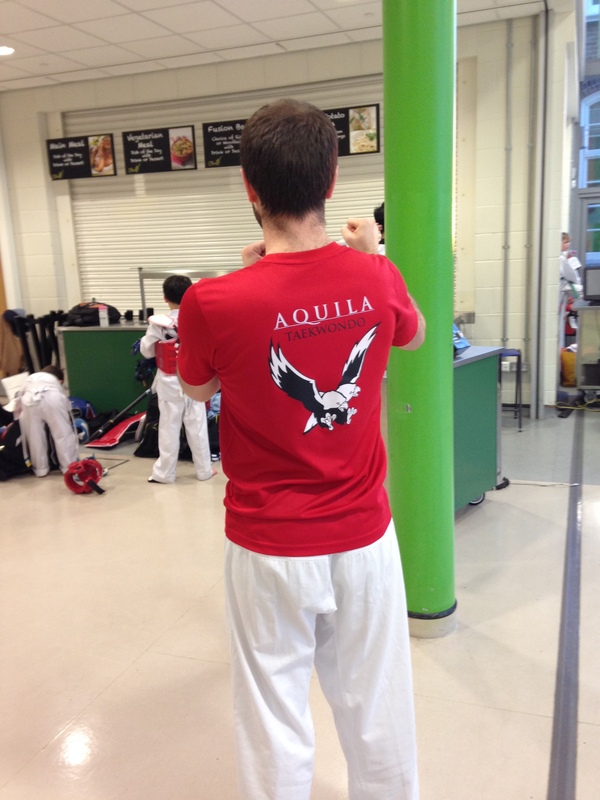 Aquila Taekwondo had performed well across all the weight and age categories – and plenty of people had impressive bruises on their feet, legs, and arms. 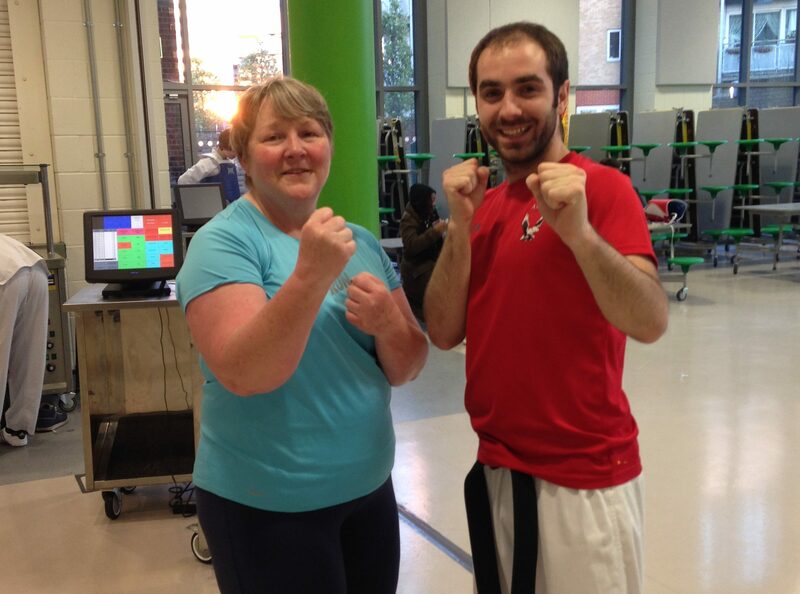 We inspected the bruises and discussed how the competition had gone: Georgina had won her bout, Stephanie had lost a closely-contested bout and was happy with the outcome. After a warm-up of stretches and drills, Master Kuzey asked Georgina to demonstrate a routine. She barely seemed to touch the floor as she stepped towards him, launching a series of kicks against the pad he was holding. He asked her to repeat the sequence, this time at a slower pace. I knew I’d be stepping through the sequence rather than jumping. We formed two lines to take our turn. I tried to move to the end of the line but NJ and Yasmin spotted my tactic and got me to practice with them, then moved me up the line. I advanced towards Master Kuzey, he coached me through each move, encouraging me to lift my knee higher, kick from my hip, keep my foot flexed, and land a kick on the pad. Then repeat it all on the side. All the way across the dining hall. It took me some time. It took less time for the more advanced group in the line alongside me. But when I took my place at the end of the line, people in both lines told me I’d done well. And my confidence grew with each repetition. Towards the end of the class, Master Terry approached Master Kuzey with a challenge: the junior group wanted to spar with the adult group. They outnumbered us by about two to one, and looked eager. Master Kuzey explained that once a challenge was made, it had to be accepted and we lined up. I tried to hide at the back of the adult group. We all bowed. They rushed forward and surrounded us in groups, moving on to the next adult when they’d had enough. They were fast and fearless. Whichever way I turned, a small person was advancing and kicking, then running off laughing to spar with a more worthy opponent. After what seemed hours, and was probably only a few minutes, a halt was called and we all bowed. The adult class regrouped and we all looked startled. ‘Was everyone else as terrified as me?’ I asked, and a few people nodded. 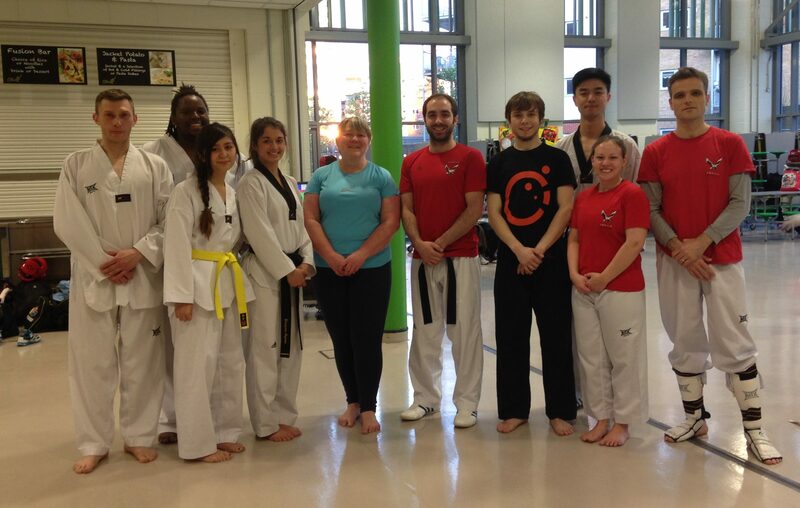 Most of the adult group had begun practicing taekwondo as children but some had taken it up when their children joined an Aquila Taekwondo class and some had taken it up at college – NJ and Yasmin were studying at Goldsmith’s College and attended a weekly class there too. It’s a full contact sport but I could see how some of the techniques and exercise could benefit people recovering from a long illness because the training improves balance, flexibility, stamina, strength, and posture. 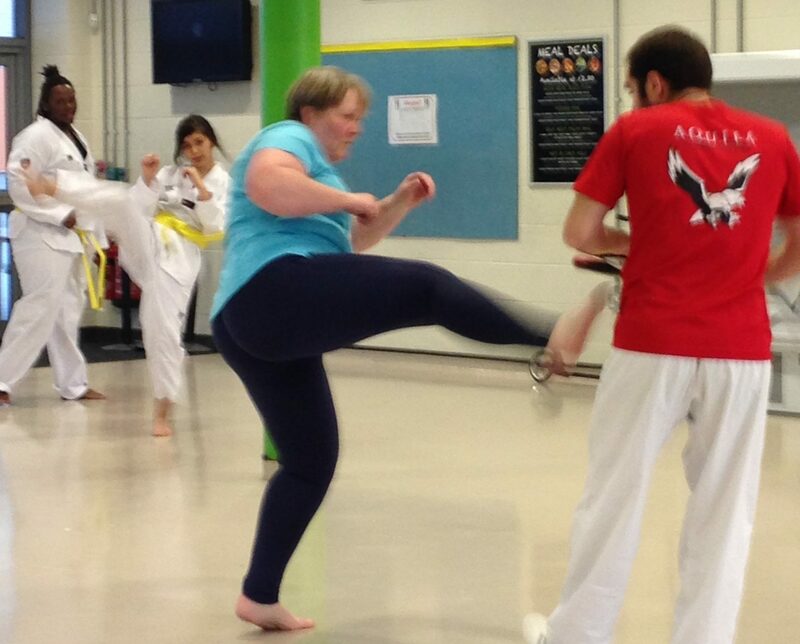 I need improvements in those areas now but I think I’d really have appreciated learning taekwondo when I was in early recovery after finishing chemotherapy. And, with its emphasis on improving the focus of the mind, I suspect taekwondo would have helped me manage the worry and horror of chemo brain.